Scientists say the dramatic increase in flows is likely due to the arrival of younger, hotter magma in the system. A week after scientists predicted significant shifts in Kīlauea’s eruption style, those changes appear to have begun. The new developments include fresher, hotter magma gushing out of fissures on the southeastern flank of the mountain on Saturday and Sunday. In another major shift, at least half a dozen explosions of ash and steam have burst from the volcano’s summit since Wednesday, with one blast sending ash plumes higher than 9 kilometers. Although Kīlauea is known as an effusive volcano, producing runny lava that fountains up from vents or oozes out of fissures, it does have a history of explosive activity, last observed in 1924, according to scientists with USGS’s Hawaiian Volcano Observatory (HVO). Satellite observations after the first round of explosions showed that the summit’s crater vent had nearly tripled the size of its opening from about 5 to almost 14 hectares. In addition, an indentation of about 6 hectares had developed on the east rim of the crater, reflecting a slumping of the rim toward the growing pit. These shifts in Kīlauea’s eruptive behavior are taking place at two widely separated sites that are linked to the same internal volcanic processes, the scientists explained. Kīlauea’s summit lies more than 30 kilometers from the lower east rift zone, where lava emerging from the ground since the first week of May has destroyed some 40 structures and forced the evacuation of more than 1,000 people. Scientists suspect that outflows of lava from fissures in the rift zone helped cause magma levels to drop in the vent in Halema‘uma‘u Crater at the volcano’s summit. As the magma level descended beneath the water table, water infiltrated into the vent, where it was vaporized, explained Steve Brantley, deputy scientist-in-charge of HVO. When rocks plugged the vent, the steam built up pressure until it was released in powerful blasts. Since the lava lake at the summit began to drain on 2 May, coinciding with subsidence of the summit, indicating that the magma reservoir beneath the volcano was emptying, conditions at Kīlauea have lined up with the pattern of activity that preceded the volcano’s 1924 explosive eruption. “This is following the script we’ve been talking about,” Brantley said late last week. Scientists discovered early in the nearly 3 weeks since this most recent eruption of Kīlauea began that the lava exuding from the ground in the lower east rift zone was old. It likely was emerging from underground magma-filled fractures, called dikes, where the molten rock had been lingering for decades or even longer. Having cooled with age, the lava emerged viscous and sticky—more sluggish than fresh, fast-flowing lava. Since that discovery, agency volcanologists suggested that once the old lava was pushed out, a fresher batch could follow. That now appears to be occurring. On Friday, the USGS announced that initial testing of a lava sample collected 1 or 2 days earlier had found that the molten rock was younger and hotter. This fresh Kīlauea lava tends to be runnier, therefore producing more voluminous, faster-moving flows. Not long after the results of the sample testing were known, fissure activity increased. The volume of exuded lava surged. Four fissures merged into a continuous line of lava spatter and fountaining. Some lava poured downslope, moving as quickly as 300 meters per hour. It formed two fast-moving, channelized lava flows, which joined and separated as they moved toward the ocean, eventually plunging into the water in two locations. “With the ocean entry, we have a new hazard,” warned USGS scientist Janet Babb. Steam generated when lava enters the ocean creates lava haze, or “laze,” a cloud containing hydrochloric acid gas mixed with volcanic glass particles that can cause skin and eye irritation as well as breathing difficulty. “Given the vigor of ocean entry and wind direction…we estimate the effects could reach as far as 15 miles [24 kilometers] downwind,” Babb said. Scientists reported another new development in the rift zone Sunday morning: A large hole opened in the ground beneath one of the new lava channels. 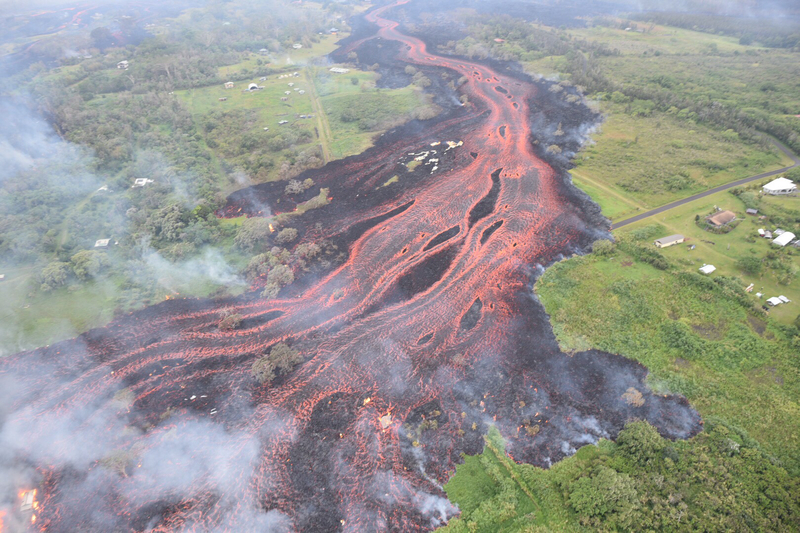 “The hole opened up [across] the entire width of the channel, and all the lava that was flowing east is pouring down into the hole,” said USGS scientist Wendy Stovall. Scientists still aren’t sure why and how the openings form and where the lava goes, but similar activity was seen in a 2011 Kīlauea eruption. “The lava that poured into the ground never reappeared at the surface,” she said. The barrage of summit blasts that heralded the beginning of the anticipated but rare explosive phase of this Kīlauea eruption began around 6 p.m. local time on Wednesday. Subsequent explosions rocked the summit again four more times: at just past 4 a.m. Thursday, shortly before midnight Friday, around 4 p.m. Saturday, and around noon Sunday. The explosions generated large plumes of steam and ash, prompting Hawaii County Civil Defense to begin distributing masks on Thursday and to advise residents to stay indoors. Nearby communities reported ashfall. The largest summit blasts released energy roughly equivalent to that produced by an earthquake of about magnitude 5, according to a preliminary seismic measurement, Babb said. The explosive activity slowed on Sunday in the wake of the last of the blasts before it began increasing again, and USGS scientists cautioned more explosions could occur without warning. The explosion hazard prompted the staff of HVO, which is perched on Kīlauea’s summit, to relocate last week to a temporary office at the University of Hawai‘i at Hilo, nearly 50 kilometers away. Still, HVO scientists have been able to detect and monitor the explosions remotely with instruments that remained in place at the summit. “Kīlauea is one of the best-recorded volcanos in the world, so we’re able to see these explosions as they play out in very high-fidelity,” said USGS scientist Wes Thelen. 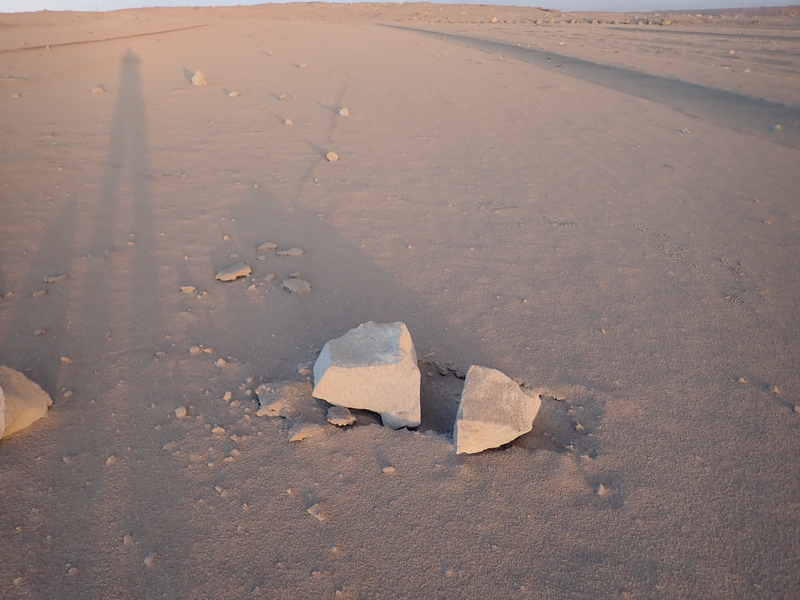 A smaller explosion last week apparently hurled a rock roughly a half meter long several hundred meters away from Halema‘uma‘u crater, where HVO scientists spotted it prior to their relocation. Brantley said it will likely not be known if the eruptions have produced more “ballistic blocks” until it is safe for scientists to return to the summit. “At this point, we’re not making plans to run down to the crater floor to measure boulders,” he said. Correction, 23 May 2018: This updated article no longer states that there were earthquakes as a result of explosions at Kilauea’s summit. Citation: Loomis, I. (2018), Faster lava flows, explosive eruptions begin at Kīlauea, Eos, 99, https://doi.org/10.1029/2018EO099655. Published on 21 May 2018.